I've been turning to slow cooker recipes more and more since going back to work, especially on Wednesdays when we rush home from work to eat, clean up, and then host community group in our home. 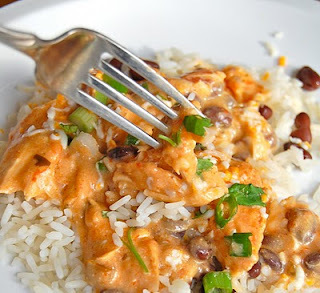 I started a board called "Recipes : Slow Cooker " and this salsa chicken was one of the first recipes I ever pinned. Place chicken, soup, taco seasoning and salsa in slow cooker and stir to combine. Turn on low for 6-8 hours. When you get home from work, remove chicken and shred. Discard the bones. Stir in black beans, corn, and sour cream, as well as the shredded chicken, turn slow cooker up to high and replace the lid. Put a pot of rice on to cook. Serve creamy salsa chicken over rice. Click here for printable version of Slow Cooker Salsa Chicken. So yummy! The whole family loved this one. I loved that it was super easy to throw together in the morning before work and a cinch to finish it off when I got home. These could be eaten as Rice Bowls where everyone doctors up their own bowl with shredded cheese, chopped green onions, cilantro, etc. The chicken is also delicious as a filling for burritos or stuffed into taco shells. You could also serve it with Cilantro Lime Rice. The great thing about this recipe is that all I have to remember is the number ONE: one pound, one cup, one can, one package....easy easy! If you want to follow me on Pinterest click here. Whenever I try recipes and really like them I place them on the board "Recipes : I Tried and Loved." Thank you for testing it! I need crockpot meals for Tuesdays when I work and will be putting this on the list. Looks good! I love getting inspiration from pinterest, and I love that you put the recipes to the test! Looks so yummy! I have loved trying out the recipes from Pinterest that I see pinned a lot. And I love the idea of serving this as a taco!! I made this; it was a big hit with the hubs and the toddler. Thanks! I used about 1lb of boneless, skinless breasts, and only managed to defrost them about halfway before I had to throw them in the pot and run out the door. Cut each breast into 3 giant chunks. Cooked on high for 1 hour and low for 3. Perfect! 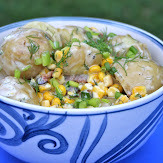 Definitely I will include this recipe of yours to my meal plan next week for my family. Thanks for providing us some ideas here. Ciao! I tried the recipe today... Awesome...delicious...thanks for sharing...waiting for more like this..